When an online slot game is called "Everybody's Jackpot", the implication is that you have just as much chance of striking it rich as anyone else – and that's exactly what you'll find when you spin this Playtech creation. Part of the always lucrative Playtech progressive jackpot network, the Everybody's Jackpot online slot game is one where sharing really is caring. Thanks to a unique jackpot system, you can win even if you're not spinning. Not sure what we mean? Join us now and read our Everybody's Jackpot slot guide and we'll show you why this is one of the most impressive progressive jackpot games in the iGaming world! Play Everybody's Jackpot Slot Demo for Free! Play Everybody's Jackpot for Real Money! First things first, Everybody's Jackpot slot is a progressive jackpot game, as the title would seem to suggest. This means that a small portion of your bet is taken and added to the communal prize pool. However, unlike many progressive jackpot slots online, Everybody's Jackpot lives up to its name by paying money to everyone with a stake in the game. 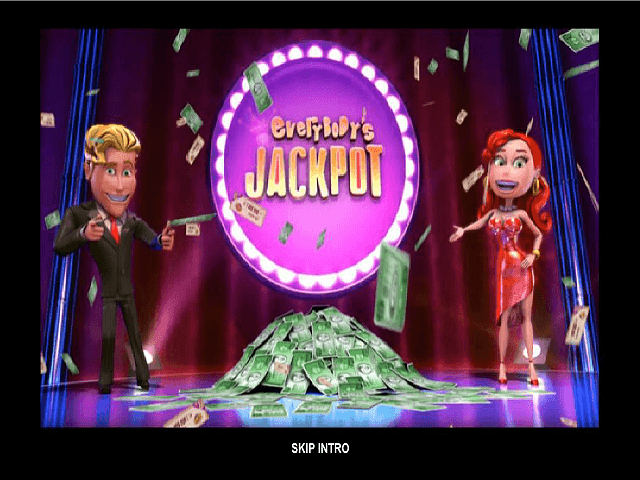 We'll delve into the details of this game's prize structure a little later in this Everybody's Jackpot slot review, but for now you need to remember that this game isn't like the rest. 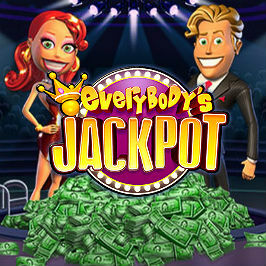 In fact, if you're looking for a better way to play, Everybody's Jackpot is a fantastic option! 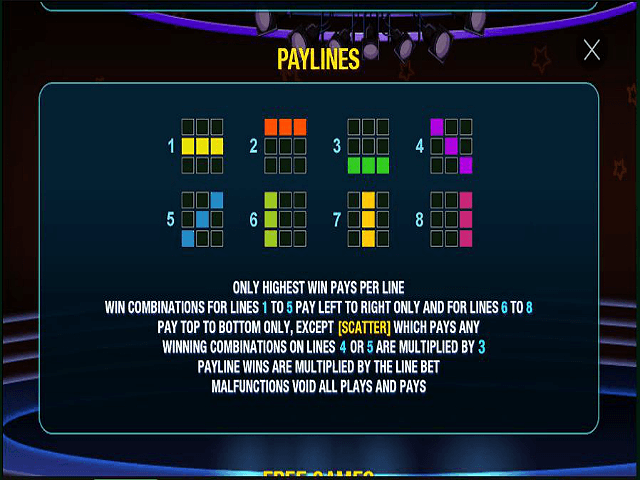 Before we can outline the unique payout table this game has, we need to show you how to play Everybody's Jackpot. Fortunately, like many of Playtech's top online slots, the road to riches is fairly well laid out. Before you can spin the reels, the rules of the game say you need to set your bets. Doing this requires nothing more than adjusting the line bet from £0.05 to £8. With three reels and eight lines in play, this means that any denomination you choose will be multiplied by eight. So, for example, if you set the line bet to £1, each spin would cost £8 due to the paylines. Once you've got this straight, you can roll through spins as you normally would and match two or more symbols to pick up a prize. On top of standard wins ranging from 1x to 250x your line bet, wilds are there to substitute any symbols except for the scatter. Moreover, three or more scatters (the Everybody's Jackpot slot symbol) will pay up to 200x your line and give you 12 free spins, a generous feature not found with every Playtech creation. When you first ante-up, you'll notice a "jackpot bet counter" to the right of the reels. This counter basically tells you how much you need to stake in order to qualify for the jackpot payout. Once you've reached the minimum spend (£50), you'll have a shot at winning a portion of the progressive jackpot. Put simply, Everybody's Jackpot pays out its top prize in the following way: the progressive jackpot can strike at random on any spin. Once it hits, the player responsible will take 70% of the prize. After this, the remaining 30% is then distributed among those who hit the qualifying mark within the last 24 hours. Players that bet the most in the most recent timeframe win more of the prize pool everyone's bets have been building, while 15% is divided equally between those that bet the minimum within 24 hours. 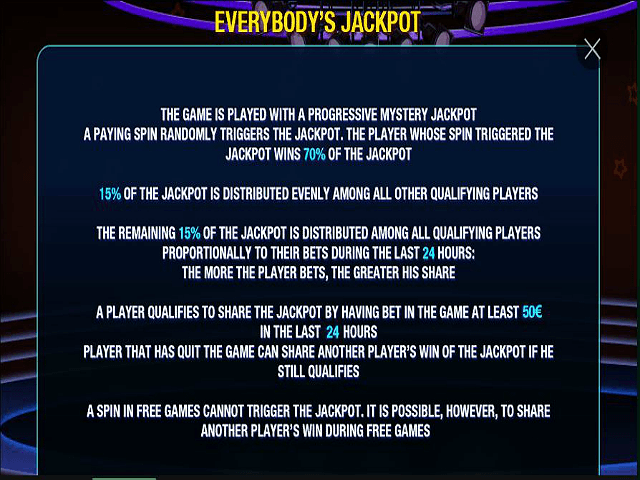 Basically, if you play this progressive jackpot slot and meet the minimum bet, you'll have a shot at winning even if you're not online at the time of the jackpot win. 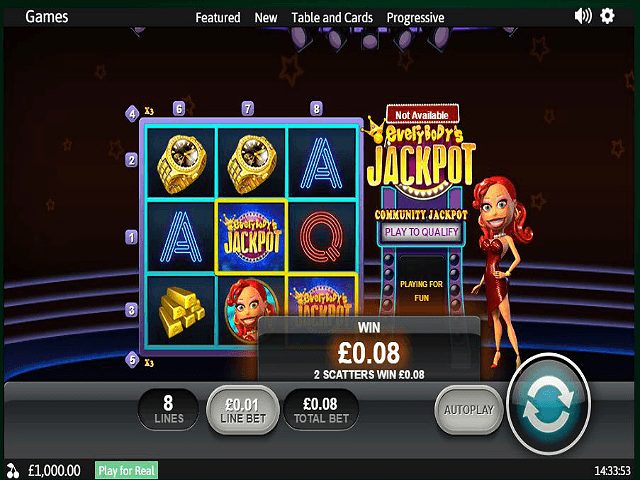 This, in our opinion, is what makes the Everybody's Jackpot online slot game so appealing to players everywhere. Regardless of your skills, your stakes or the times you're online, you can walk away with a sizeable prize just by anteing up! Share this Everybody's Jackpot Review today! If you like Everybody's Jackpot, you'll love these slot titles too!